Do you want to constantly monitor the Internet in case someone mentions your name or that of your company? Or even the competition? Google Alerts is your tool. They are very easy to use. If you enter a word or phrase, you will receive an email alert whenever Google finds a new mention on a website. Google alerts are useful for more than just increasing your ego. Follow-up mentions related to your business or brand can help you find opportunities to improve link building, make branding, define collaborations, and more. Enter a search term to crawl. Google alerts will show a preview of the results as you type. Select “Show options” (below the search box). Choose the frequency with which you want to receive alerts: once a day, once a week. 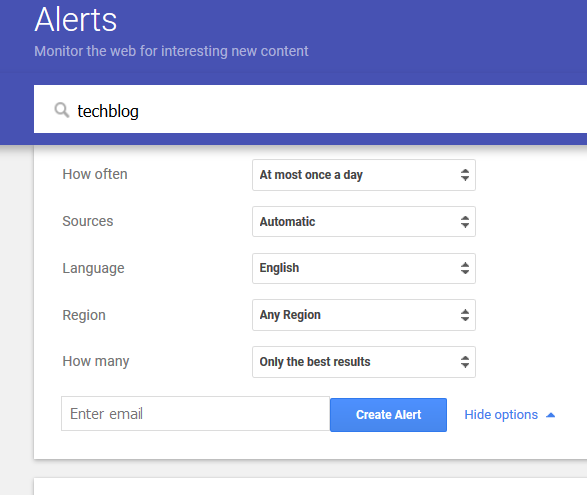 Choose a source for your alerts: web, blogs, news, etc. If you are not sure, leave it in the default (automatic) option. Choose how many results you want to see: “all results” or “only the best results”. Choose an email address in which to receive alerts. People will sometimes mention your brand without adding a link. The links help you position better in Google, so you want as many high-quality links as possible if you’re interested in SEO. Links help people navigate better, which means that mentions without links hinder readers’ access to your site. If they want to know more about your business, they will probably have to turn to Google (and most will not bother doing this). If you find a mention without a link, you already have most of the way travelled. The author already knows who you are, and often only a small push is needed to convert this mention into a link. 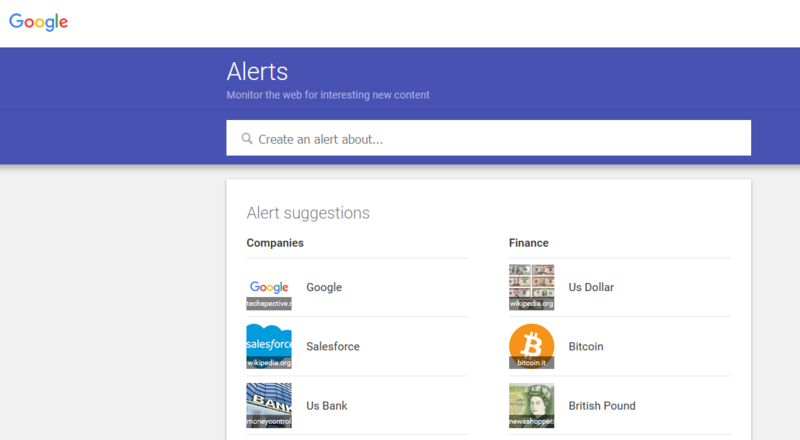 But first, you need to find these mentions, what you can do with Google Alerts. You just have to set up Google alerts for any term related to the brand. You will receive an email when Google finds new brand mentions on the web. But do not stop there. 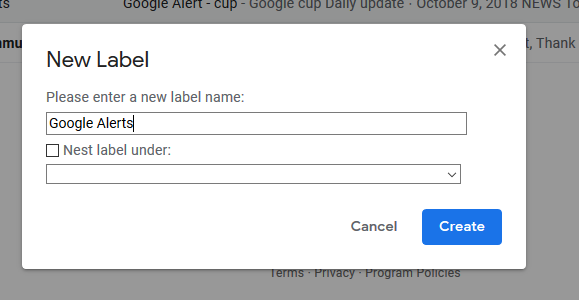 Set up several Google Alerts for all terms related to your brand or even names of competing companies. What to do If You Receive an Alert about Mention? Consult the pages, consult the source code (click with the right button of the mouse -> see the source code of the page) and search for your domain using CTRL / CMD + F.
If you do not find any results, there is no link. Therefore, you should consider the possibility of contacting the author and asking him to add it. Attention! Even if there is already a link, you may want to participate in the debate about your brand or use the mention as an opportunity to build a relationship. For example, if someone mentions you and links you, it may still be worthwhile commenting on that article and thanking them. You can even get in touch by email if you think it’s appropriate. Most companies regularly publish new content on their blogs, including your competitors. Stay up to date on what the competition is communicating through this channel can help you discover new ideas of topics for your blog. An RSS feed can help you with this. But let’s be honest, RSS feeds are limited (and ugly). Do you sell digital products? Courses, ebooks, training materials, etc. In that case, I do not think we’re wrong in stating that torrent (and other illegal downloads providers) are your worst nightmare. Being attentive to the mentions of our brand allows us to find external websites that offer our products illegally. 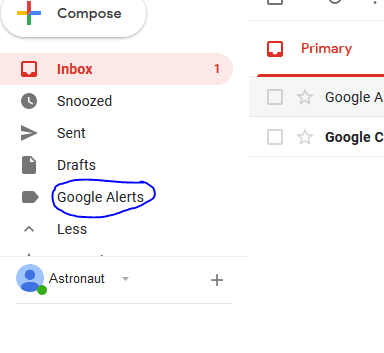 What is the biggest problem with Google alerts? The constant avalanche of emails. Fortunately, we have a perfect plan to organize it. It all starts with the Google Inbox. Google Inbox allows you to “group” your emails in groups. 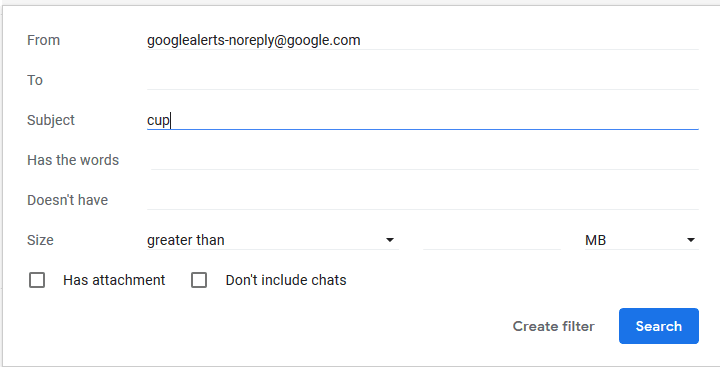 You can easily exclude all emails from Google Alerts from your primary inbox at one time. These emails are not deleted, they are simply hidden in a folder with the proper name. 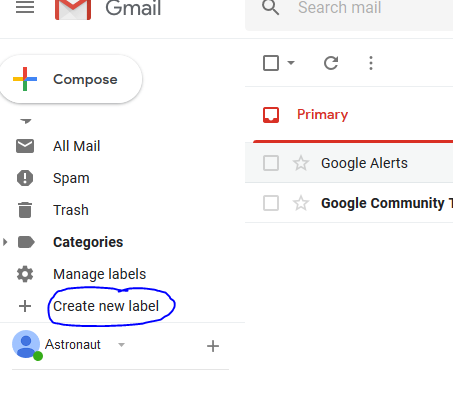 To do this, create a new package called “Google Alerts” and configure it to automatically add messages from ‘googlealerts-noreply@google.com’. 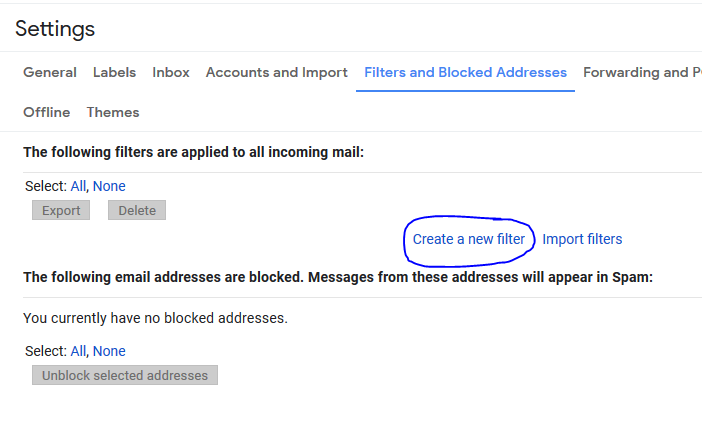 Step 4: Select Filters and Blocked Addresses and then create new filter. 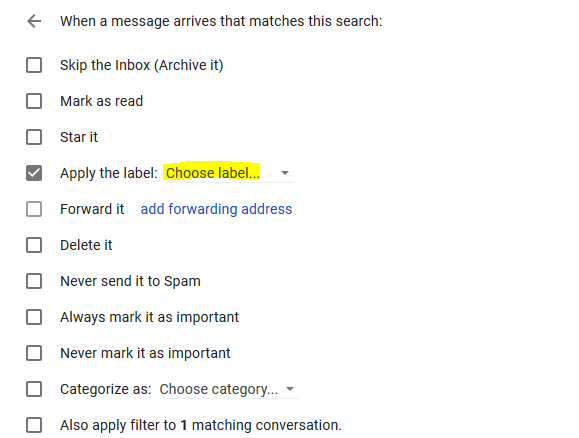 Step 5: Add Email Id of which emails are to be considered. Step 6: Select the setting for filter and choose on which lable to apply it. 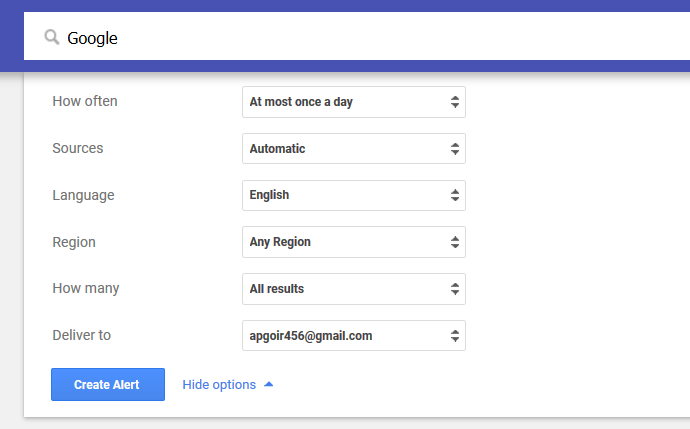 Finally, we recommend that you receive Google alerts at most once a day (you can choose the frequency when creating them). Google alerts are a powerful tool that does not cost a penny. You can use them for everything we have suggested in this article and for anything else you can think of.